Collision-less large-Reynolds-number astrophysical plasmas are prone to turbulence. In this context, it is necessary to consider the impact of turbulence during believed magnetic reconnection events in solar and stellar flares or in planetary magnetospheres. Magnetic reconnection is a multi-scale process and turbulence can be the key to bridge the gap between the magnetic energy release at large scales due to magnetic diffusion at small scales through the Richardson's picture of direct and inverse energy cascade. Moreover, diffusion of magnetic field by turbulence at small scales might lead to fast reconnection. Such an interaction between turbulence and fast magnetic reconnection in weakly dissipative plasmas is considered through the plasmoid instability. The turbulent transport coefficients are characterize by a turbulent mean-field model and are identified as a turbulent diffusion, crosshelicity and a residual helicity. These turbulent coefficients are found to lead to fast reconnection for a single 'X'-point current sheet as well as in the case of multiple 'X'-points, as present in plasmoid unstable current sheets. For the plasmoid instability, the turbulent coefficients are also found to be responsible for fast reconnection. In addition, the dynamics between diffusion and sustainment of magnetic field, related to the turbulent diffusion and residual helicity effects, are shown to be important for fast magnetic reconnection in presence of strong guide-magnetic field perpendicular to the reconnection plane. For residual helicity intensities stronger than turbulent diffusive ones, a time delay in reaching fast reconnection regime is observed. Finally, this turbulence dynamics obtained during the fast magnetic reconnection phase of the plasmoid instability is used to relate energetic electrons often found near astrophysical current sheets and magnetic reconnection. 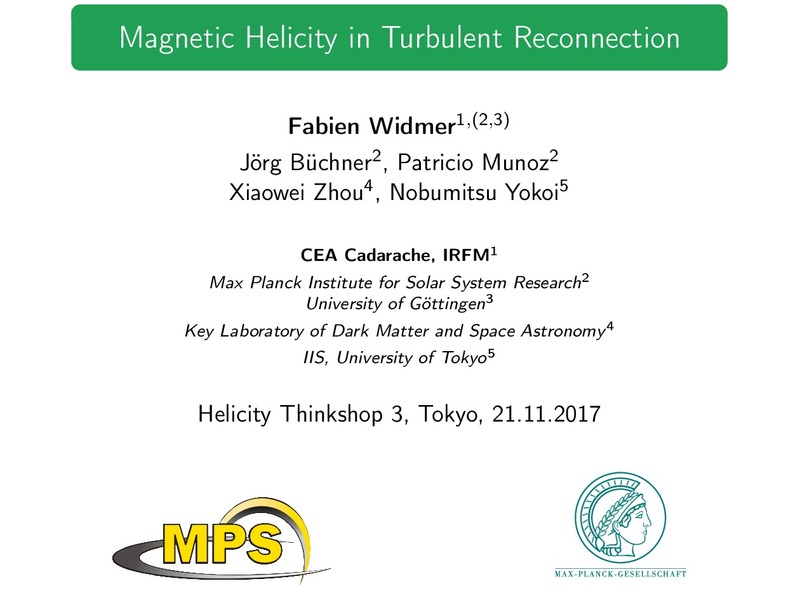 We obtain that fast energetic particles are accelerated by turbulence during fast reconnection processes if residual helicity intensities are weaker than the strength of the diffusion of magnetic field by turbulence.